Matlock was a 60 minute legal drama series that aired on NBC for the first six seasons and then on ABC for three more seasons. It was about a criminal defense attorney who was so good at defending those falsely accused of murder that he could demand $100,000 to just take a case! Matlock would not only get a jury to find his clients innocent, he'd also find the real killer and prove they had committed the murder! 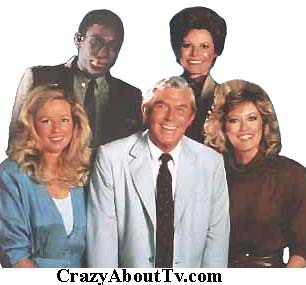 The TV series, "Jake And The Fatman" was a "spin-off" of Matlock. Episodes 5 & 6 titled, "The Don - Parts 1 & 2" (see below) featured guest stars William Conrad, Joe Penny and Alan Campbell in their roles on Jake & the Fatman for the very first time, although their characters names were different. Jake and the Fatman also spun-off a series titled, "Diagnosis Murder". Andy Griffth appeared as "Ben Matlock" on episodes #74 and #75 of that series titled, "Murder Two - Parts 1 & 2". Ben Matlock was a Harvard educated Lawyer with a Georgian accent. He often came off as a tough, stuffy character and occasionally had a "potty mouth" but underneath he had a heart of gold. His favorite food was a hot dog. Andy Griffith also played the role of Ben Matlock's father in a few flashback episodes. Linda Purl who played Charlene Matlock on the Matlock TV show was in every episode of the first season except episode #14, "The Rat Pack". Her former husband from a very short marriage, "Desi Arnaz Jr." was guest-starring on that episode. Apparently, there were still hard feelings over the break up even though five years had passed. Charlene Matlock and Leanne McIntyre had been designated as being sisters in the outline for the series but nothing was ever said about it during the entire series' run. Several of Andy Griffith's co-stars on the "Andy Griffith Show" appeared on Matlock as guest stars. They were Don Knotts (Barney Fife), Aneta Corsaut (Helen Crump), Jack Dodson (Howard Sprague), Arlene Golonka (Millie Hutchins), and Betty Lynn (Thelma Lou). Before he came to work as an investigator for Matlock, Conrad McMaster had served as a Deputy Sheriff. Thank you for visiting our Matlock TV show page!